Please refer to our stock # 1957 when inquiring. 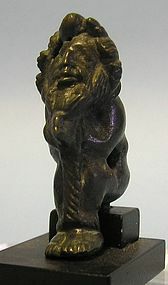 Miniature Romano - British bronze figure of a bound Captive, ca 1st Century CE. Bearded figure with long hair seated and leaning forward. A rope tied around his neck, hands continuing down to his feet which are also bound. Pierced below and through the side for attachment. Cf. no. 105 in Merhav, et. al., A glimpse into the Past, The Joseph Ternbach collection. In excellent condition, 2nd Century CE. 1 3/4" high. Ex: Christie's New York. The Sack of Rome occurred on August 24, 410. The city was attacked by the Visigoths, led by Alaric I. At that time, Rome was no longer the capital of the Western Roman Empire, having been replaced in that position by Ravenna in 402. Nevertheless, the city of Rome retained a paramount position as "the eternal city" and a spiritual center of the Empire. The sack was a major shock to contemporaries, friends and foes of the Empire alike. This was the first time in almost 800 years that Rome had fallen to a foreign enemy. The previous sack of Rome had been accomplished by the Gauls under their leader Brennus in 387 BC. The sacking of 410 is seen as a major landmark in the fall of the Western Roman Empire. St. Jerome, living in Bethlehem at the time, wrote that "The City which had taken the whole world was itself taken."